Doesn’t she capture your heart? She did mine. I saw her in a World Vision magazine we got in the mail the other day. I got the mail right before I started to cook dinner and the urge to paint her was to much to resist – when you’re inspired to paint something you can’t just let it pass because it might not come back. This was another one of those paintings that flowed from the Spirit right out of my paint brush. 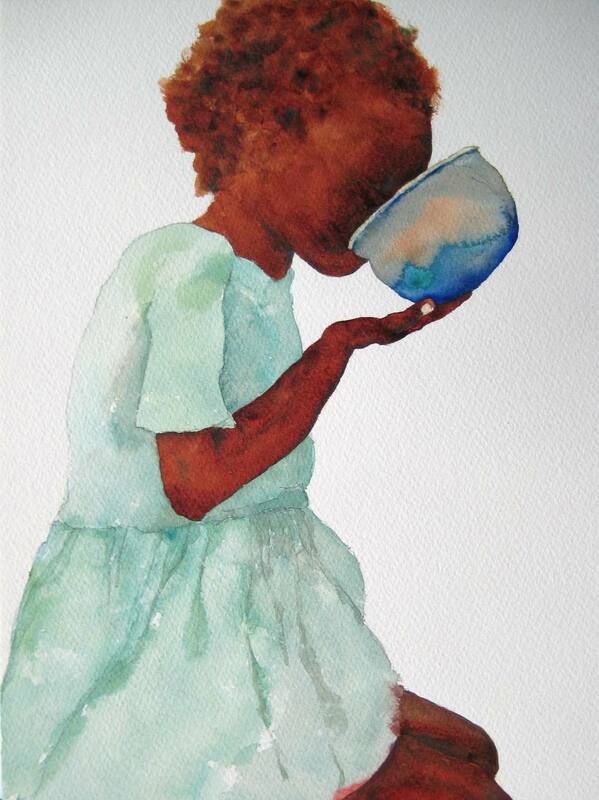 So I painted this little girl while cooking – that’s pretty good for me because I AM NOT a multitasker. I can’t even talk on the phone and cook at the same time or something will set on fire. I sat down today with my bible and asked the Lord to lead me to the perfect verse for her. Poor Grady was napping while I flipped through my bible and when I found this verse I can’t remember what came out of my mouth, I just remember it was a little on the loud side because Grady was jolted awake from his nap :). The verse captures the painting and the Spirit behind this painting perfectly. oh my, oh my, oh my…i knew when i saw the verse, that you had posted the picture. she is absolutely incredible. i can’t even think of the right words to tell you what an incredible painting i think this is….and the verse…thank you Sandi for always listening to the prompting of the Holy Spirit, never jumping ahead, never making it happen…just waiting for His sweet direction. May you continue in the work of the Lord sweet sister! Susan, you are such a blessing to me dear friend and such an encouragement. I treasure your words because I know they are not flattery, but words from the heart – a Godly heart at that. I am so thankful for friends like you who encourage with sweet words and sometimes with a sweet kick to the behind 🙂 – a loving kick, but none-the-less a kick in the right direction. For someone who is so insecure (me) the Lord is sweet to put dear friends around me who love me and encourage me in the way of the Lord. You’re friendship is priceless and I’m thankful the Lord has given us more time lately to grow in that friendship. I love you too dear sister! It reminds me of yesterday’s sermon too, Linda! All I can say is “Praise God!”–for the work that he is doing through you. Your painting is absolutely remarkable. Remarkable actually doesn’t even cut it–I’m simply speechless!! What a gift you have–to be able to paint so amazingly well and use it for God’s glory. I think it is awesome that you are using your gifts for Him. I am so happy for you and glad that you decided to sell them. You are such an inspiration. It brings me great joy to see all that you do for God! You will soon be famous in BowlingGreen! Angie, thank you soooo much for the kinds words and encouragement. Thank you for taking time to look at the paintings and leave comments. I hope to see you in March!!! Oh no – famous – yikes :)! thank you so much for your obedience to His Spirit in using His giftings in you to bless others and touch their hearts with what touches the Father’s heart. Coming from Kenya just this past month, and working with the orphans, and seeing the heart of the Father for these children, your painting just keeps this ever fresh before me. I love it and would love to add to the one my daughter graciously presented me with while visiting her. Thank you for your heart of love and compassion. Thank you Katie for your kindness. I will make sure you know when prints are made of that one. Sandi, this is by far the prettiest picture I have ever seen. Trish. OK Sandi I love it. It made me cry today thinking about God’s calling for us. I love you girl! Tracy, I didn’t even think about how this painting would be special to you guys – but that makes perfect sense! Who knows, when yall adopt from Africa, you could have a little girl that looks like this little girl!